Why should you put time and effort toward sharing someone else’s content? By sharing curated content, you can bolster your original content creation efforts, demonstrate that you pay attention to what’s going on in the industry, and share valuable information with your audience. However, before you start sharing, make sure you have a solid content curation strategy in place. 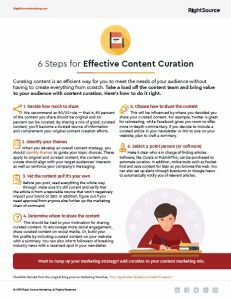 Download the checklist, “6 Steps for Effective Content Curation,” for a few best practices to follow.